The authoritarian dictator of Turkmenistan, Saparmurat Niyazov, passed away yesterday at the age of 66. Even by dictatorial standards, this man was eccentric. Among other things, he ordered the closure of all hospitals and libraries in rural parts of his country, reasoning that rural citizens were not worth the resources consumed. He also ordered the construction of an ice palace in his desert country, required that every clock have a picture of his face on it in order to force people to see his visage, and named the caldendar months and days of the week after himself and his family. But other than that, he was not exceptionally violent, and perhaps not as directly destructive to human life as Saddam Hussein or Pol Pot. Niyazov did not arrange for a successor, and hence a leadership vacuum now exists in Turkmenistan. While this is a country of only 5 million people and a nominal GDP of only $18 billion, it has a location of disproportionately high geopolitical importance. 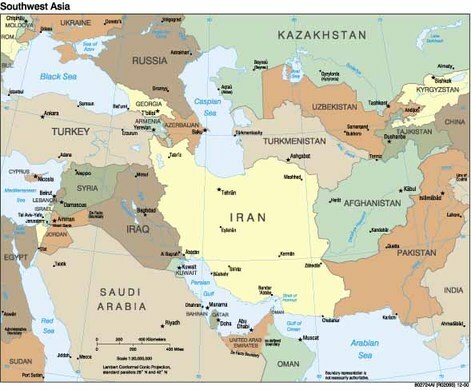 Just look where Turkmenistan is on the map. Turkmenistan has just as long of a border with Iran as Iraq and Afghanistan each have, and is known for practicing a relatively moderate version of Islam (we don't see many terrorists of Turkmen origin). Even more importantly, Turkmenistan is the country with territory that is the closest to Tehran. If the US were shrewd, we would heavily back the factions most likely to induce democratic reform in Turkmenistan, culminating in the ascension of a leader similar to Hamid Karzai. There isn't even the hindrance of a Taliban-type theocratic group as in pre-2001 Afghanistan. We would then encourage the formation of the same democratic institutions we have helped create in neighboring Afghanistan. After that, we could inject economic stimulus into the economy and rapidly modernize the infrastructure, so that Turkmenistan achieves the 10%+ annual GDP growth that is currently in full flow in Afghanistan (Turkmenistan already has 6.5% GDP growth). This would cost the US a pittance and not a single military casualty, and yet Iran would be even more tightly encircled by countries at varying stages in the process of forming democracies. Iran could, of course, send trouble across the border like it is doing in Iraq, but Iran's resources would then be even more thinly divided than they are now. Iran would be drawn into yet another front in its proxy war against the US and Israel, and will be more prone to overplay its hand and do something that backfires. That was good analysis. The added benefit will be having a friend in the Petroleum rich Central Asian region. I agree but I am only cautiously optimistic. While a power vacuum gives Turkmenistan a roll of the dice to get a better government, it could also end up with another dictator and this one might be less loony and more vicious. While America has a lot to offer as incentives for the country to move towards reforms, and openness, this rests on the eventuality that whoever grabs the brass ring of governance is reasonable. All America may be able to do right now is make offers and hope that they are accepted. Probably spelling out specific incentives for specific political and economic reforms ASAP so that the power brokers know what they can rely on if they support a reformist movement would be a good move. All America may be able to do right now is make offers and hope that they are accepted. Probably spelling out specific incentives for specific political and economic reforms ASAP so that the power brokers know what they can rely on if they support a reformist movement would be a good move. And this is why the US must act quickly. This is a very small country in population, and we could easily offer incentives that would appear very large to their tiny economy. We might also offer marketing consultants for the factions we like. That is something we do know how to do. Has the US ever backed a party that ended up being good for the US in the long run? It seems more accurate to say that Iran is fighting a proxy war with Saudi Arabia. Our support of the Sadr-friendly, Shiite-dominated government actually makes us more of Iran's ally than its foe as far as Iraq is concerned. Poorly-conceived invasions make for strange bedfellows, it seems. You apparently are ignorant of the fact that the US is actually less vulnerable to oil shocks than most other countries in the world. Then again, from your poor grammar, you are probably ignorant of many things, including why the US will still be the only superpower in 2030. But I am glad that your Romania has contributed troops to the coalition in Iraq. I think US has enough on its plate, let them (Turkmenistan) solve their own problems, besides there is Russia who can control the region, and I hope they will bring order there. GK, US is actually quite vulnerable, and the reason for that - US citizens; there will be panic and riots, and even army wont save the situation, and there is a good example - New Orleans. How long did it take to restore the order in NO?! That's amazing, how you are so "pro-American", GK... Is it so in reality? Aint'ya from India, my friend? What did make you to turn from your native country to US? The Republican points of views? "The US Must Act Quickly in Turkmenistan"... Do you know that US already screwed itself in Ukraine? The "Orange Revolution" actually has put the country in the chaos and ruined its economy? I think US first needs to learn about the culture, traditions and relationships before brutally change the flow of history. I think it's time to finish such "cowboy" actions and grow up. I am both in the US. It is possible to be both Indian and American, as America is the only country that assimilates all types of people so well. That is why so many more people want to come to the US than want to leave it. At any rate, India is a very pro-US country. George W. ush is greatly loved in India. and there is a good example - New Orleans. Apparently, you don't know that in the US, no natural disaster has ever killed more than 1200 people. In France, 15,000 people died from just a heat wave in 2003. That just shows how far ahead the US is relative to even a 'rich' country like France. You really are quite ignorant about the US, and I doubt you have ever lived here for an extended period of time. I think it's time to finish such "cowboy" actions and grow up. Rather, America has already saved the world twice in the last 70 years. Go educate yourself about history. What country are you from, and what is your country doing about Darfur in Sudan, Zimbabwe, etc? No problems get solved unless the US solves it. Of course, for you, black people's lives don't matter. Your jealousy of America is quite evident. That is why the US will still be the only Superpower in 2030. "You really are quite ignorant about the US"
Thanks for the attack, GK... I wonder how can I be ignorant about US, if I live there? "America has already saved the world twice in the last 60 years"
How and when? The only events US participated in really have badly reshaped the world... If you dont know, the tension in Middle East is rising, and it's not a good sign. US lost the war in Iraq on many levels, and it's going to be even worse. "no natural disaster has ever killed more than 1200 people"
You mean, reported casualties? Do you know that many are not reported? And do you know how many people are killed with hand guns every year? About 30,000 a year, 85 people each day! And it's going up... Have you ever seen a person who was shot in front of you, and you are watching the blood drops flying through the air like in "slo mo"? And the body follows the bullet inertia, and his so surprised face impression like in a bad dream?... I hope you did not. "Your jealousy of America is quite evident." "That is why the US will still be the only Superpower in 2030." I doubt that, unless US will plant another revolution in China or Russia... And I hope it will not happen, the World needs diversity, not a super power. I wonder how can I be ignorant about US, if I live there? I didn't think it was possible until now. er.. you should read about something called World War 2, and the Marshall Plan. Plus, the Cold War. But I suppose you believe the world would be a better place if the USSR won and Communism swept the globe. Only in your jealous anti-American dreams. We are actually on track for victory in 2008. That you call yourself "World Citizen", yet are opposed to the spread of democracy, is quite shameful. So I take it you oppose the War in Afghanistan, and approve of 9/11 too? Please clarify. And do you know how many people are killed with hand guns every year? These are not natural disasters, which is the topic at hand. Surely even you are capable of grasping this distinction. And I hope it will not happen, the World needs diversity, not a super power. So you actually prefer Communism over democracy. I guess no one told you that the biggest even of the last 15 years is the stunning defeat of socialism. "So I take it you oppose the War in Afghanistan, and approve of 9/11 too? Please clarify." I do not approve 9/11, dont state what you dont see. Your post "We Will Decisively Win in Iraq...in 2008 - Part I" is not about spreading the democracy, it's more about someone's pride, "patriotism" and false perception of victory. The problem is that those who run the Iraq war are ignorant in understanding the Iraqis culture, as well as Middle East cultures, besides all those "restoration" operations are run by the corporations who DO NOT care about "restoring" Iraq but care ONLY about the size of their profits, nothing more. Same was in New Orleans, that's why it was the disaster, actually. "Me: And do you know how many people are killed with hand guns every year? GK: These are not natural disaster..."
"So you actually prefer Communism over democracy"
Your remark about the defeat of socialism is interesting, but the point is that the contemporary US "Democracy" is very similar to what was in USSR, but with a capitalist twist. "Only in your jealous anti-American dreams"
You are uttering this "Anti-American" phrase alot across your blog. Can you clarify what is the "Pro-American" then, because I dont see you've ever defined it yet? This could be an interesting read: USA Is One Of The Worst Countries In The Global Peace Index. On the contrary, they understand it far more than the ill-informed critics do. Go spend a few minutes reading Bill Roggio or Michael Yon, who are actually in Iraq, and have been there for a long time. They are in a much better position to assess Iraq than you are. Plus, you did say that you oppose the War in Afghanistan as well (something 75% of Americans support). Why? Is this only because Republicans are in the WH. That is a very immature (yet sadly, typical) tantrum of leftists. America is a democracy, as per Freedom House. You have not provided any proof to the contrary other than your own opinion. but the point is that the contemporary US "Democracy" is very similar to what was in USSR, but with a capitalist twist. I've heard some strange things, but that may be a candidate for the strangest. Does American annex neighboring countries, the way the USSR did? On the contrary, millions of Mexicans are trying to come to the US illegally, even to work in menial jobs. A bogus index by a fanatical group, and has been debunked many times. If you really think the US is less peaceful than Yemen, you are no longer worthy of being taken seriously as a thinker. So why do you live in a country as violent and dangerous as the US? Anyone who finds happiness in the misfortunes of America, particularly when America tries to do good deeds, is anti-American. Anyone who jumps at any propaganda point designed to make the US look bad, no matter how phony, without applying any honesty or logic in assessing it, is a fanatical anti-American (which has deep roots in jealosy of America).